Earlier this year, I foolishly thought Nintendo and the people at HAL Laboratory might allow 2018 to be something less than another luxurious year to be a Kirby fan. How wrong I was. Maybe some non-Kirby fans can find some hope in what’s gone down with Kirby these last few months, if it’s any indication of how other largely offline Nintendo games will be updated after release. One uplifting treat for Kirby fans has been the post-release developments of Kirby Star Allies, which began as a mediocre sidescrolller for one to four players. Its developers have since treated it with a precious care that few other Nintendo-published Switch games have received. There was also Kirby’s triumphant appearance at the end of a recent showcase for Nintendo’s biggest game of the year, Super Smash Bros. Ultimate. That event ended with a stunning video for the game’s adventure mode that seemingly depicted Kirby as the most powerful hero of that game’s wide-ranging all-star roster. In the trailer, Kirby survived an otherworldly attack that appeared to annihilate everyone from Mario to Sonic to Pikachu, leading to jokes that Super Smash Bros. Ultimate is secretly another new Kirby game. A trailer for Nintendo’s biggest release of the year, Super Smash Bros. Ultimate, suggests that Kirby is the only character left standing at the start of the game’s story mode. Not Mario. Not Pikachu. Not Sonic. Not Wii Fit Trainer. The Smash thing is cute, but again, the way Nintendo and Kirby development studio HAL Laboratory have supported Star Allies has been a marvel. Shortly before launch, fans were told the game would receive multiple free updates. Free post-release content is standard for many games these days, though not that common with more kid-friendly franchises like Kirby, let alone ones that don’t focus on online multiplayer. Nevertheless, Star Allies has received two waves of free updates and is getting a third much bigger one at the end of this month. The first update for Star Allies arrived in late March, just a couple of weeks after the game did. It added three new “dream friends,” which is the game’s term for buddy characters. These newcomers can be added to the player’s Kirby-led crew in the main game, and they can also be the lead character in Star Allies’ weirdly named “Guest Star ?? ?” mode, which runs players through a sequence of timed challenge levels that they can play as any of the featured characters in the main game. These challenge levels are pleasant remixes of environments in the main game and can stack up to a nearly two-hour run for each character to zip through. The members of the new downloadable roster have been plucked from earlier Kirby games. The first wave included characters from 1995’s Kirby’s Dream Land 2 and 1996’s Kirby Super Star. Another free update in July added three more characters hailing from Kirby 64, Kirby Squeak Squad and Kirby & the Amazing Mirror. All of the characters introduced in the new waves have had their own animations and moves, and HAL added new levels to the “Guest Star ?? ?” mode to cater to their movesets. When playing that mode as the painter-fairy duo Adeleine and Ribbon, for example, “Guest Star ?? ?” opens with a level asking the player to figure out paths to take based on what they are able to paint on various easels. Last week, Nintendo announced the game’s final Wave 3 update, which will add between four and six characters, depending on how it implements player control of a trio of villainous sisters. Added to the roster for sure are characters from Kirby’s Return To Dreamland and the recent 3DS games Kirby Triple Deluxe and Kirby Planet Robobot. The character from that last game is the nefarious Susie, who appears to be able to blast through Star Allies using a gun and mech suit. The new wave of characters would already be extraordinary if applied to any other side-scrolling series. It’d be as if a new 2D Mario game that had launched with a roster of multiple playable characters got 10 or so more over the course of seven months, all from classic Mario games. The thing is, Nintendo hasn’t done this kind of thing even for Mario (or Yoshi) and certainly doesn’t go as all-out as HAL, which announced that Wave 3 would also include a new “Heroes From Another Dimension” mode.. This new mode appears to consist of new levels and remixed bosses. Star Allies’ post-release improvement has also come via frequent and amusingly granular insights from its developers on the Switch’s news feed. This feed is a place where developers can theoretically keep messaging their fans. The channel for Star Allies has received 17 updates, making it one of the busiest on the platform. Some of those messages have just hyped the new free content, but others include quotes from the game’s sequence director explaining how the game’s main menu was made, or the level design director explaining the ingredients of a chef character’s pot and noting that when he cooks in the presence of a character from the second wave of new dream friends, his stew includes a special piece of strawberry shortcake that is a reference to a moment from Kirby Squeak Squad. Star Allies may not be the greatest Kirby game, but the stream of news updates makes clear that a lot of work and a heap of easily-missed details were put into the adventure. Along with the DLC, they’ve changed Star Allies’ image. In March, Star Allies appeared to be a pretty game that suffered from being too easy, too short and too lacking in the ingenious level design of recent Kirby games like Triple Deluxe and Planet Robobot. The level design deficiencies are still an issue. 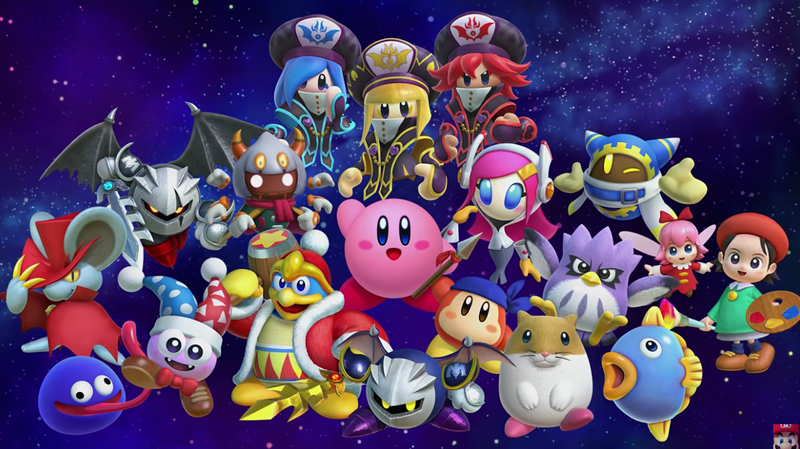 Star Allies’ main and side modes are disappointingly straightforward and lacking in clever new ideas, but the game has received a heap of added personality and flair thanks to the new characters, making it now feel like an interactive celebration of the Kirby franchises’ long run. With any luck, the new Heroes From Another Dimension mode will also provide more challenge and clever design. All of this post-release improvement to Star Allies is a little surprising. The Kirby franchise isn’t niche but it’s also never been as big a deal as Mario, Zelda or Pokémon. Kirby games don’t tend to make Game of the Year lists or close out Nintendo E3 press conferences. Star Allies also doesn’t seem, at first glance, to be tailored to the kind of post-release content updates that Nintendo has seemed most eager to do. Many other Nintendo games on Switch have received new free or paid content after launch, but most of that has been delivered in games with online multiplayer, offering the likes of new characters to Mario Tennis Aces and new weapons to Splatoon 2, for example. What to make of Star Allies’ unexpectedly good post-release improvements, then? It could be a HAL thing. It could be a Nintendo thing. It could be a make-good for a game that launched feeling too slim. It could be a future blueprint for how largely offline, mostly single-player Nintendo mascot games might be enhanced in the months following release. Or it could just be that this is how it goes for Kirby fans, where the gaming life is a little sweeter and there’s always new, good Kirby content right around the corner. As the new Smash Bros trailer suggested, he is, after all, the ultimate Nintendo hero.